I am working on documenting a story about two individuals who have been implanted with brain implants against their will that monitors their thoughts and injects the voices of two people into their heads. Believe me, I wondered whether this technology existed when I first heard about it. 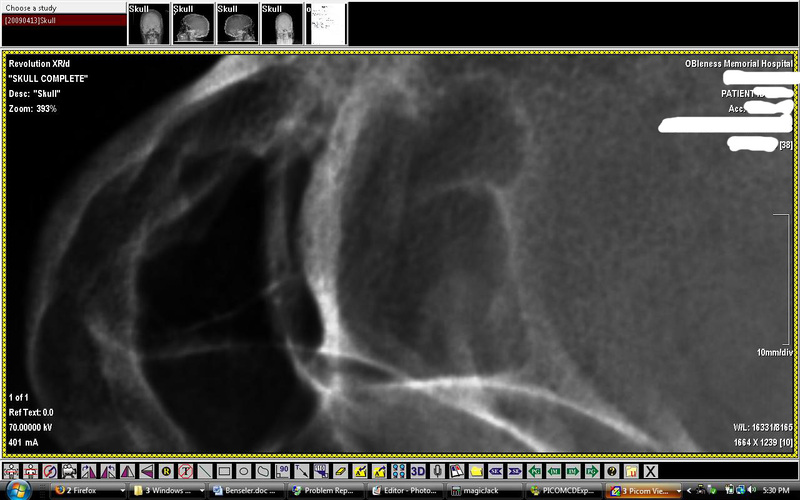 But I have done four months of intensive research on this, and have copies of the x-rays from one of the individuals. Experts in the field confirm that this technology does exist, and both of these individuals are extraordinarily credible, but are afraid because the motivation behind this is to lock them up as being insane, because they are civil liberties activists. 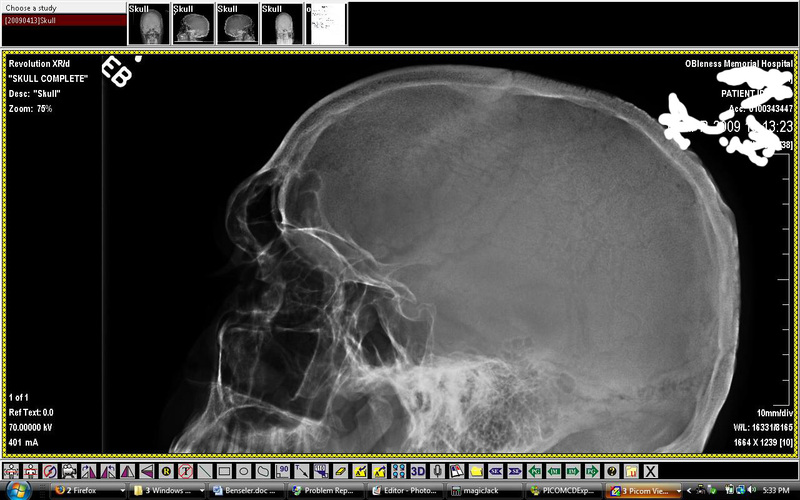 Calling all x-ray technicians, or people who have x-rays of their own brains, please look at the frontal lobe (just under the forehead) at a black object, about 3 mm by 7 mm, and call me at 740-753-3888 or email chadkister@gmail.com if you notice anything different than what you would expect. Here are two copies of the x-rays, one showing the full brain, one zoomed in to the frontal lobe, where their appears to be a brain implant. Imagine a world where one’s thoughts are monitored, and police could broadcast voices and visions into ones brain. What if such devices were to be surreptitiously placed into people’s brain’s against their will? What power would that grant those who had such information, which could be broadcast wirelessly through satellites? He said later that it was about an inch long and a quarter inch in diameter. She had recently been in a hospital. He said about two weeks later, two men came in, asking for him to give an affidavit about the woman. He would not give any information, because she was a client. The source wanted to remain anonymous, because he said their goal was to try to declare him mentally unfit to stand trial when he uncovered that they had put a nanotechnology transmitter into his brain. He said that they were hypnotizing him to call law enforcement, to turn himself in for things that they falsely accused him of, and woke him up through the night. What if such devices could be made extraordinarily small, utilizing nanotechnology and carbon fibers, such as to be near undetectable? What if they used very high frequencies, about 600 megahertz, such as to be undetectable by most private investigators? Such technology was called uberveillance by Michael G. Michael, from the University of Wollongong ’s School of Information Systems technology (ninemsn, March 20, 2009). Such technology could record what a person saw, the person’s movements, and even their thoughts, Dr. Michael said. In 1999, BBC reported that researchers had implanted a microchip into a cat that detected what the cat was seeing, and broadcast that into a computer, using the output of 177 brain cells. Researchers in Hiroshima , Japan are developing miniature cameras. Furthermore, the devices themselves would greatly contribute to the susceptibility of cancer, both through the microchips themselves, and the need for wireless communication coming from the most sensitive part of the body to such electromagnetic fields. A series of scientific studies from 1996 to 2006 found that the rate of cancer was between 1% and 10%, for mice and rats implanted with the microchip transponders were later diagnosed with sarcomas, fibrosarcomas and other invasive cancers surrounding or attached to the nanotechnology devices, according to a study published by S. Le Calvez et. Al. in Experimental and Toxicological Pathology in 2006. With the horrific abuses of civil liberties granted by the Patriot Act, the Department of Homeland Security is reportedly working on implanting people with microchips against their will. Though in gross violation of the Constitution, the secrecy granted by the Patriot Act could be used to try to keep clandestine uses of such technology hidden. With absolute power granted by such secrecy, the very survival of the union – and our planet – is at stake.